Spoiler alert! “Murder in the Cathedral” is about a brutal killing in church — but don’t worry, we didn’t just ruin the play for you. The famous story of the assassination of Thomas Becket, the Archbishop of Canterbury, in 1170 is front and center here — a story so full of drama, power dynamics and internal struggle that T.S. Eliot — yes, that T.S. Eliot — couldn’t resist writing a play about it. Eliot focused his drama, which is running now through Oct. 2 at the Church of St. Joseph in Prospect Heights, on the last month of Becket’s life. He’s back in Canterbury after seeking refuge in France for seven years for clashing with King Henry II over his allegiance to a high power other than the throne. Though welcomed back in his homeland, Becket still faced certain death if he continued to rock the boat. Becket’s struggle is symbolized by four characters who appear in the play, tempting him with physical safety by “leav[ing] well alone”; with riches by serving the king; with power by resisting the king and forming a coalition with like-minded barons; and, lastly — and what Becket contemplated the most — with the glory of martyrdom. Becket denies all four tempters, but he cannot escape his fate, as, less than a month after he steps foot in Canterbury Cathedral, he’s murdered by the king’s knights over suspected treason. The setting itself provides a large part of the appeal in Brooklyn Arts HQ’s production of the classic. Director Alec Duffy makes full use of the majestic Church of St. Joseph, with the altar, pulpit, pews, vestibule and even confessional used by the actors. When the knights come knocking for Becket’s head, they are literally locked out of the church, their urgent banging immediately placing you in the scene. 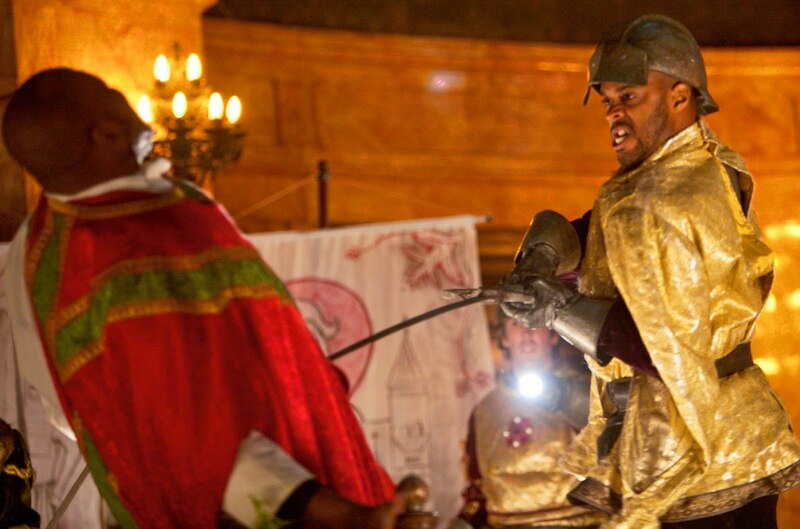 The performances are equally effective, most notably Godfrey Simmons, Jr., as the fated Becket. The archbishop is the meat of the play, as most of the action revolves around his internal struggle, and Simmons’s performance is commanding and full of gravitas. (He might even be too good — at one point following a sermon, several members of the audience responded to the archbishop’s “Amen” is if they were attending Sunday mass). The dynamic between Simmons and this fourth tempter (Jordan Coughtry) is especially compelling as the actors play out the drama by encircling the entire audience. The church may be an ideal setting for “Murder in the Cathedral,” though the acoustics in the Church of St. Joseph, while great for music, result in echoes of the actor’s lines that sometimes make it difficult to follow Eliot’s suburb poetic verse. Still, it’s a small price to pay for what is ultimately a gripping, memorable performance. “Murder in the Cathedral” at the Church of St. Joseph [856 Pacific St. between Vanderbilt and Underhill avenues in Prospect Heights, no phone], now through Oct. 2. Thursday through Saturday at 7:30 pm and Sundays at 2 pm. Tickets $10 (suggested), $5 for groups of four or more. For info, visit www.murderinthecathedral.com.